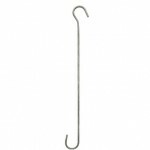 Stainless steel ‘s’ hooks with off-set design. Creates a quick extension to make feeders, hanging baskets, etc. easy to reach. Available in 12″ and 18″ lengths.